This page is dedicated to our extended bird families. While our comprehensive adoption process is similar to other rescues, we believe what sets us apart is the relationships we build with adoptive parents. Our contract requires three updates about how the bird is doing, but very often we stay in touch with these families for much longer. Our approach to adoptions is quite different from other rescues, as well. We must always carefully screen applicants and be sure to address any potential issues, but fostering mutual respect with applicants helps us to create a bond. When we are assessing or “investigating” an applicant, we always treat them kindly and try not to be too intrusive. We do not believe in “snooping”, but focus on learning everything we can about our families and building trust with them. In doing so, we feel that we get a very accurate picture of who they are and how well they would match up with our birds. We are very thorough and do check references, but we have found that we are able to successfully screen our applicants while maintaining a high level of respect. We are quite proud of our record and decided to highlight our adoptions, our birds and their new families here!! Gonzo & his new family came to visit this month! The adoption became final and we were happy to officially proclaim Gonzo the proud new owner of two fantastic people! His Mom, Elizabeth & Dad, Ryan filled us in on all Gonzo's great adventures and his new found love for cuddling & public displays of affection!! We are so happy for Gonzo and so proud to include Elizabeth & Ryan in our extended bird family - they were made for each other! For those that know us well and have followed Rasta's story, you know how special he is to us. For a while we thought Rasta would remain a permanent resident at CBH & we were happy to have him! However, Rasta's turnaround was amazing & we knew all at once that he was ready for a family of his own - and now he has one! 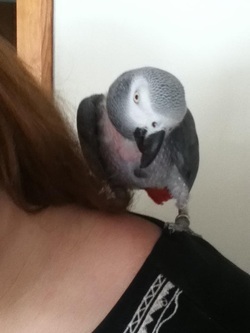 Rasta was placed with a dear friend and great Avian advocate and he's doing beautifully! We are very proud of Rasta for all his hard work & we are grateful that he found his forever family within our extended bird family! More details about this inspirational story to be posted soon! Please join CBH in wishing Rasta the very best that life has to offer x 10 because he deserves it so, so much!! We love you, buddy! Baby was adopted on June 26th. When Baby met Jim, it was immediately clear that they were made for each other! 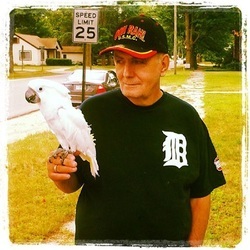 Jim & his family had actually come to meet a different bird, but fell in love with our sweet Baby & vice versa! She stepped up for Jim within moments of meeting him and refused to let him go! Baby also won the heart of Jim's young grandson, who was a little afraid of her at first - it didn't take long for Baby to show him how amazing she is! We know that Baby is going to be very happy with her new family & we're so thrilled for her!! 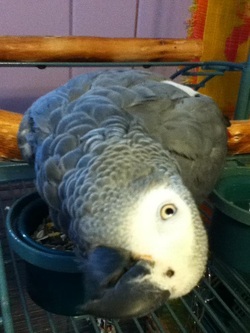 Allie, our 13 year old, female Congo African Grey was adopted on June 5th! Her new family reports that she is doing really great - she loves to wrestle around on Mom's bed & is enjoying her new feathered siblings! 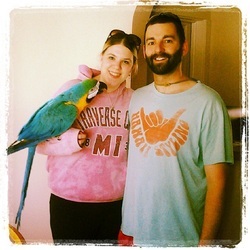 We couldn't be happier for Allie & her new flock, who are a wonderful family of bird lovers! We're looking forward to some photos soon! "When Rufus first came to me, he had been with the same owner for many years. His former owner was no longer able to care for Rufus but graciously shared information to make Rufus' transition as painless as possible. On his part, it was not love at first sight. Rufus did not seem to want to have much to do with me but he seemed to like my cousin. Rufus has learned the wolf whistle and he and Rick enjoy whistling back and forth with each other. I spent time talking to him, hand feeding him and loving him. He is coming along very nicely. He now enjoys eating with me and having his head scratched. Thank you Alan, Tracey and John for allowing me to adopt this wonderful feathered friend. I really enjoy him and I know Rick does, too." Blessings to you, your family and all the birds! Sam has been such an amazing addition to our family! He is very sweet and gentle. He loves to spend time with all of us, even the dogs and younger kids. He is a huge part of our family. Thank You so much... for taking the time to get to know us, for bringing Sam into out lives and for all the help and advice you guys have given us over the months. We will never forget all you have done."